Scotland will take on United Arab Emirates, Canada, Hong Kong and Nepal in Group A of the 2015 World Cup Qualifier in New Zealand next year. The Netherlands, Kenya, Namibia, Papua New Guinea and Uganda make up Group B. The qualifying event runs from from 13 January to 1 February, with two places at the finals in Australia and New Zealand up for grabs. 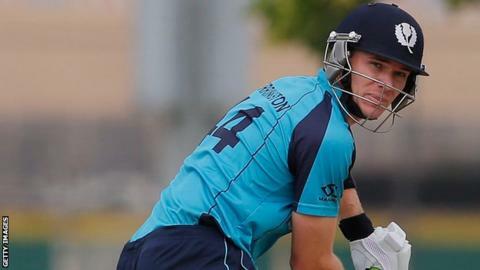 Last month, Scotland failed to secure a place at the World Twenty20, finishing seventh in the qualifying tournament. Group A rivals UAE, Hong Kong and Nepal all finished above the Scots in the T20 format. Ireland and Afghanistan have already secured places at the World Cup, having finished first and second in the World Cricket League. Scotland finished fifth in the standings, below UAE and the Netherlands, having won half of their 14 matches. "It's another opportunity for the lads to play well, come together as a team and make themselves difficult to beat," said Paul Collingwood, who joined the Scottish coaching team on a temporary basis for the World Twenty20 and World Cup qualifying events. "We all know what the goal is, to get a World Cup spot, but you have to break it down as much as possible and win game by game and I'm absolutely 100% sure that the skill level in this side is very high and the guys are passionate about playing for Scotland. "Everything ticked the right boxes; I just think we need to get the right result out in the middle. I don't think there's anything else we can do in terms of preparing guys, it's up to them to go out there and perform well now." The top three in each section at next month's qualifying event will progress to a Super Sixes stage. One qualifier will join England, Australia, Sri Lanka, Bangladesh, New Zealand and Afghanistan in Group A, while the other successful team will go up against South Africa, India, Pakistan, West Indies, Zimbabwe and Ireland at the big event.